The Coordinated Public Transit - Human Services Transportation Planning Committee is a public advisory committee with open membership. Public and private sector agencies and individuals particpate on the Committee. Meetings are monthly, usually on the third Wednesday. The public is always welcome to come to meetings. The agenda reserves time for participants to network at each meeting. The Committee makes policy and program recommendations through the Coordinated Plan process. See more discussion of the organization. 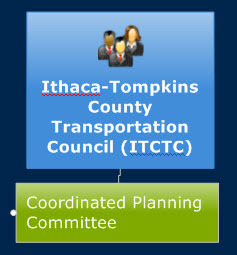 Coordinated Public Transit - Human Services Transportation Planning is conducted under the auspices of the Ithaca-Tompkins County Transportation Council (ITCTC). Although the ITCTC is hosted by Tompkins County, it is an independent metropolitan planning organization (MPO). The ITCTC includes two committees. The Policy Committee is the primary decision making committee. The ITCTC Planning Committee evaluates the work of the ITCTC and makes recommendations to the Policy Committee. The Coordinated Plan Committee reports to the Planning and Policy Committees. The ITCTC adopts the Coordinated Plan, annual updates to the plan, competitively solicits and approves priorities and projects for FTA JARC and New Freedom program funding. Fernando deAragon, Executive Director of the ITCTC, oversees these activities. Tompkins County is a Direct Recipient of Federal Transit Administration (FTA) programs. The County was a Subrecipient of the former FTA JARC & New Freedom programs administered by the New York State Dept of Transportation . NYSDOT manages the FTA Sec 5311 Rural Formula program for which Tompkins County is an applicant. In summary, Tompkins County applies to FTA for Sec 5307 Urban Formula grants and applies to NYSDOT for Sec 5311 Rural Formula grants which are transferred to new Sec 5307 grants. The County contracts with subrecipients to implement the Sec 5307 program. Tompkins County's FTA grant management function is located in the Department of Social Services, along with the County's mobility management program. Dwight Mengel, Chief Transportation Planner, Tompkins County Dept of Social Services, has managed these responsibilities since July 2006. Every December, the I-TCTC amends the Coordinated Plan which lists projects to be funded in the new year. The projects include Special Community Mobility Projects funded from a suballocation of Sec 5307 Urban Formula funds as mobility mangement, capital or JARC operating assistance projects. Also, Sec. 5310 Enhanced Mobility for Seniors and Individuals with Disabilities program projects are listed in the amendment. Tompkins County is responsible for determining grant and management strategies to fund high priority Coordinated Plan projects approved by the ITCTC. Further, the County is responsible for providing the technical capacity to oversee all Subrecipients and their compliance with FTA regulations. The Tompkins County Legislature authorizes all grant applications to FTA and NYSDOT, accepts awards and disperses the funds through project contracts or through allocations in the county public transportation budges. Therefore, the ITCTC and Tompkins County work together to mange the work of the Coordinated Plan Committee, programming funding for projects, and managing FTA and New York State transportation grant programs. A discussion of mobility mangement in Tompkins County can be found here.